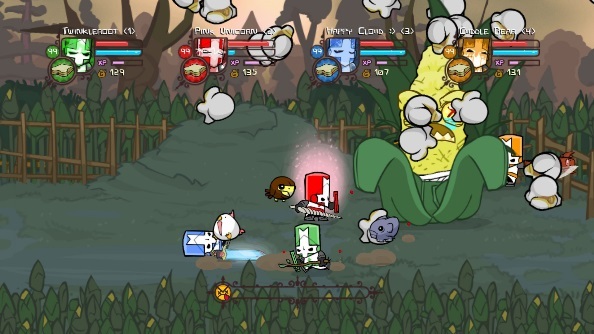 We’ve got 10 keys for the newly updated Castle Crashers to give away! You know Castle Crashers: it’s the well-loved hack-and-slash filled with cartoon beasts and knights. Well, it just received a big new update on Steam, and to celebrate we’ve got 10 copies of the game to give away. Want in on a quest to crash some castles? It just takes a couple of clicks. The new update adds an uncapped frame rate, much higher resolution textures, and a brand new game mode: Back Off Barbarian. This is a survival match, and you’ll need to stay alive for a whole two-and-a-half minutes to unlock the new achievement. Can you hack it? If you’d like to be entered into the draw for a Castle Crashers key, please use the widget below. The more things you do in the widget, such as liking our Facebook page (make sure you do for more giveaways in future! ), the more entries that go in the hat to be randomly selected. The email address we ask for is for contacting winners and sending them their Steam key code; we promise we won’t sign you up for anything weird. If you’re randomly-selected to get a code, you’ll find it in your inbox – from where you’ll want to proceed directly to Steam and redeem it via the ‘activate a product’ box under the ‘Games’ tab.